Fulltiming in a truck camper is fun, exciting, and challenging, and like any other camper, it has its advantages and disadvantages. Its important to know your vehicle, what it can handle, and how to prepare for truck camping, as it is different from camping in an RV or towing a small pop up. Since a truck camper requires a truck you have the opportunity to do some off roading, something that cannot be done with a regular camper. You can opt to leave the main highways and travel the less paved roads of the Americas but to do this, you must consider a few things. Fulltiming in a truck camper, you want to be sure that if you do travel off the beaten path, you dont damage the camper or truck. Its important that you have a truck with all wheel drive, significant ground clearance, and while stick is better than automatic for this kind of driving, its a matter of preference. There's a practical advantage to having a cabover camper, instead of a motorhome and a towed vehicle, or a truck and a towed trailer...insurance. Because only one vehicle was moving we only had to have insurance coverage for the truck. You just have to decide whether the advantage outweighs the fact that some places won't let you unload the camper so you can use the truck for running around. Another advantage of the truck camper is that you can separate the vehicle from the abode much easier than you could a fifth wheel. You also dont have to deal with towing a car like you do with an RV, so theres no towing equipment to have to move or store. This makes taking off to go to the store, fishing, or sightseeing a simple task instead of a time consuming hassle. Fulltiming in a truck camper sometimes means literally full timing in the camper. Some parks do not allow you to separate the truck from the camper, which means you have to take the whole set up with you to go out or you are stuck at the campsite until you find one that is more accommodating or until checkout. Make sure to find out the parks policy on this before committing to a reservation. Truck campers tend to be small and cramped, especially those that offer all the amenities, like showers and a usable kitchen. However, the newer models are said to be roomier and have a more efficient use of space but this depends on your personal idea of how much space is enough. One disadvantage of the truck camper applies only to families, as the small space and generally single bed only allows room for one person or a couple. 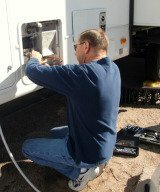 Family campers need more space, like that of an RV, and therefore have the burden of towing a vehicle. At one point my husband and I moved from a Class A motorhome into a 10' slide-in cabover camper. The camper had been gutted, so he had some major remodeling to do before we moved in, but even then there was no storage. We ended up towing an 8' cargo trailer behind the truck to hold just about everything we owned so we could just move around in the camper. 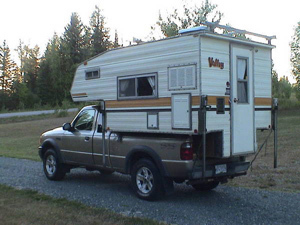 Aside from the small quarters, which may be a challenge in and of itself, there are other things to consider when fulltiming in a truck camper. Truck campers have a tendency to sway, not drive straight, and rock or roll, whichever term you prefer. Luckily, there are several solutions to this problem but they can be costly, especially if you need to apply more than one or all of the solutions. These solutions depend a lot on the type of truck you have and the size and weight of the camper so before making any adjustments do some research or talk to a mechanic or camper store or manufacturer. The obvious solution to keep anything from swaying is to install a sway bar but with the camper this does not always work. Sometimes you need air bags, which help to even out the suspension or commercial grade truck tires, which prevent the tires from rolling so much at corners. In other cases, it might be necessary to use a better brand of tie downs, which hook the camper to the truck, or install cab over struts, which eliminate the bounce created by driving over rough surfaces. As a last resort, you can try the use of heavy duty, adjustable shocks and covering your pickup bed with rubber mats, said to minimize the amount of movement on turns. Like all good things, fulltiming in a truck camper requires a little bit of work and preparation but once you get going, its more than likely youll realize its worth the effort.